These are the brownie cakes. 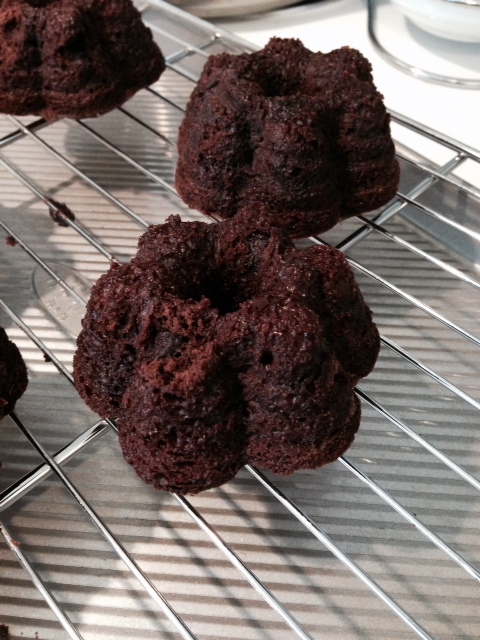 It is a small bundt pan that is made of silicone so the cakes are easy to get out, and are just the right size for one person. They are cute as can be. Here are my “cheaters” chocolate cakes. So make the brownie mix as directed. Mix in the chocolate chips – more if you like the chunks in there, less if you don’t. You coulld use white chocolate, or cinnamon or nuts – it is completely up to you. Fill each cup about 2/3 rds full and put on a baking sheet for baking. Adds stability to the muffin tin which is flexible and not steady. Bake at least 25 minutes, but check every 5 minutes after that. 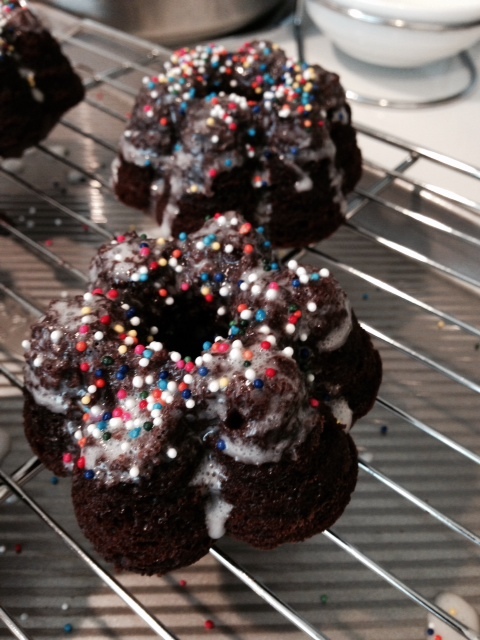 I used a skewer stuck into a few of the bundts to establish done-ness. When the skewer is clean, the cakes are done. Take out of the oven and let rest upside down on the cooling rack for 5-10 minutes. Then carefully take each on out of the pan. Mix 1/4 c powdered sugar with a teaspoon milk to start, it should be a thick but drip-able consistency. I went a bit thinner. Add sprinkles and you are done. This recipe only makes about 5 cakes.